There are many ways to do a brain dump. This post will cover a more intensive brain dump strategy that can be especially helpful to those of us who struggle with schedule-building and indecisiveness. The following method is an adaptation of an article that was published by Lifehacker. Step 1: Make Your Lists. In this case, the lists will be entitled “Must Do,” “Want to Do,” and “Maybe.” Be sure to give yourself ample room to list everything that comes to mind, make edits, and add notes to the list. Step 2: Finalize and confirm the “Must Do” list. Your “Must Dos” are events and tasks you have already verbally or mentally committed to doing. In this step, you will simply confirm and reconfirm plans then write your “Must Dos” down on your calendar and, if necessary, set reminders. This is also an opportune time to call and send emails to confirm upcoming meetings and appointments. Step 3: Evaluate your “Want to Do” list. “Want to Dos” consist of everything you want to do, but have yet to plan. Look over the Want to Do list, and ask yourself if these are all things you really want to do. Then write a number beside each item according to level of priority; “1” corresponds to the item on the list that is the highest priority to you. You may have to change and reassign numbers as you proceed down the list. Or, on the contrary, it may be 100% clear to you which items you prioritize more than others. Next, look at your low-priority items. Ask yourself whether you are 100% certain that you want to do these things. If not, transfer them to the “Maybe” list. If you are 100% certain that a particular item is something you have zero interest in doing, simply eliminate that item altogether. Step 4: Evaluate your “Maybe” List. For people who have difficulty making decisions, the “Maybe” list will probably be the longest of the three. Look at each item on the list, and ask yourself whether the item is 1) something you really want to do, 2) something you really NEED to do, and 3) whether you need more information to decide. If the item is either 1) something you want to do or 2) something you need to do, transfer it to the “Want to do list.” In some cases, you may come across items on the Maybe list that you need to fast-track to the “Must Do” list and add to your schedule, for example, scheduling a doctor’s appointment or applying to a program in which you have decided you want to participate. You will also encounter items on your “Maybe” list that you now realize you no longer want to do. Have no shame in crossing these items off completely. Lastly, f you need more information to make a decision about an item on the list, make a note detailing the actions you need to take to get the information you require to proceed with making a decision. Forward progress is the objective! With an increased focus on prioritizing, this type of brain dump requires a little more mental energy and critical thinking than a general brain dump. But for anyone who has difficulty with scheduling and decision-making, this is a very effective strategy to help streamline events and tasks in a manner that naturally flows into an organized calendar. For more organizing and productivity tools and tips, join my email list by clicking…HERE! 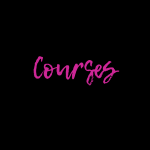 Email insiders are first to be notified of upcoming courses and receive special VIP discounts and pricing on courses and eBooks. To be fair, most of us have felt at one time or another as if we simply don’t have enough money. When that happens, we either look for an additional stream of income, or we refine our budget and try to work within it. Time is similar. However, because we can’t simply make more time, the latter approach is the default. What does it mean to learn to manage time as if it’s money? We’re all working with the same 24 hours. That part of the equation is set. Where everyone begins to differ is the very diverse ways in which we use our 24 hours. Think of your 24 hours as an allowance you receive each day. You literally can do whatever you please with your 24 hours. But for most of us, it’s not that simple, right? We decide we want housing, clothes, food, financial savings, entertainment. All those things cost. They cost money and time [unless you literally have someone handing these things to you…in which case, please come over here and advertise YOUR coaching services]. Anyhow…these things cost what I’ve come to refer to as time dollars. In planning your schedule–because you should be planning your schedule–start with 24 hours, and subtract from that each time you schedule an activity. For example, your 8-hour workday costs 8 time dollars, leaving you with 16 remaining. But actually…it’s inaccurate to begin by subtracting from 24…unless you count sleep! Sleep is so important that I always recommend starting schedule planning by setting a bedtime, deciding how long you want to ideally sleep, and scheduling a wake-up time accordingly. We underestimate the importance of sleep. While you may think you need time to go to the library, pick up your dry cleaning, and attend the birthday party you were invited to, your body places a much greater priority on repairing cells and tissues, encoding learned information into your memory, and restoring your energy. These very important activities are just a few that happen while you’re sleeping. Let’s say you plan to get seven hours of sleep each night. After subtracting seven from your 24-hour time budget, you are left with 17 hours of time that can be allocated to work, fun, leisure, and everything in between. If you ever find yourself feeling tempted to waste time or engage in an activity that does not serve your well-being or contribute to the well-being of others in a manner you can afford, actively remind yourself of the remaining hours in your time budget. Then asks if it is worth allocating time to participate in the activity. If you are a person who struggles with decision-making and prioritizing tasks, you may struggle at first with deciding which activities are deserving of your time. Don’t be discouraged. Simply do your best to make a decision. Evaluate the outcome of that decision. Then carry that analysis with you as you keep moving forward in approaching each day as if you are on a strict time budget. Eventually, you will become better at ranking tasks according to importance, balancing social commitments, and becoming a better decision-maker and steward of your time. Join my email list to receive additional free time management resources and a discount on my upcoming time management strategies eCourse. Click HERE for Time Management assessment quiz! We’ve entered the second half of 2018 and the beginning of Q3. Now is the perfect opportunity to assess how well we have been managing our time and to determine whether we are on track to have the 2018 we hoped for back in January. Check out my 10-question Time Management Assessment quiz to see how you are measuring up, and receive a free cheat sheet that outlines 10 areas you can address today to reclaim and better manage your valuable time. All over social media, I see entrepreneurs and professionals who boast about their 7-day work weeks and 12 hour days as if these things are the bragging rights of working for yourself. Hard work should be rewarded, celebrated, and praised. But are people who work non-stop ultimately cheating themselves? Their families? Even…their careers and businesses? I would venture to say yes. Here’s why. The title of this section is probably obvious to most of us. Nevertheless, it bears repeating: human beings are not machines; therefore, they need rest. We need rest. Furthermore, even most machines go on standby or require time to cool down or to be powered off. You and I are no different. When we work non-stop, there is a point at which we become less “sharp.” We become tired, and our mood deteriorates. We have to stop for food because we get hungry (and you reallllly should take time to pay attention to what you eat, chew your food properly, etc for health and nutrition reasons…but I digress). Over time, you will not be at your best; this inherently means that while you are giving 100% of your time to your business (or career), you are very likely giving much less than 100% of your competence. Don’t cheat yourself, your teams, your customers, and don’t cheat your business or career out of being it the very best it can be. Rest. Pardon my language. But the ability to multitask is another capability about which many of us love to brag. The truth is if you’re multitasking, you’re probably not focusing, which also means you’re likely cheating someone out of receiving your full attention to detail and level of competence. If you are giving time to your family, set that time aside and focus on them. If need to write important emails, schedule time to do that outside of listening to webinars, participating in conference calls, etc. Otherwise, you will retain only a fraction of the information that is conveyed during the webinar or call, and you also run a high risk of sending an email that lacks coherence or is missing important details and will ultimately frustrate the person on the receiving end. Let’s eliminate these errors by giving our full attention to whatever we’re doing. In fact, doing so will help you complete your tasks faster and more efficiently so you can move on to the next task much sooner. But, Rolanda. How Am I Supposed to Do All This? One word: planning. If you haven’t taken a look at some of my posts on scheduling and time management, check them out. As a first step, I recommend everyone spend a few days to an entire week keeping a time journal. Keep track of everything you do in a day, and note the how long it takes you to complete each task. Most people readily discover there are small pockets of time they waste throughout the day; these small pockets often add up to hours. Moreover, simply taking inventory of how you utilize your time and having the data on paper can be eye-opening on its own. Having a written account of how you spend your days allows you to interact with the concept of time more tangibly and to visualize different ways you can spend it. Once you’ve discovered exactly how you are spending your time, set boundaries. Set a bedtime. Schedule time for meals, family, and even idle time…because you need time for yourself. By setting a schedule and sticking to it, you will feel more balanced and recharged when it’s time to work, and the added efficiency will help you eliminate the need for those seven-day work weeks and 12-hour days. If you need assistance with time management and scheduling, message me to inquire about my productivity coaching services available to individuals in all locations. Please also join my new Facebook group to connect with individuals who are also determined to manage time more effectively and to achieve their goals in 2018!